In general, it could be argued that there are only 3 distinct groups and they would be Conservatories, Orangeries & Garden Rooms. 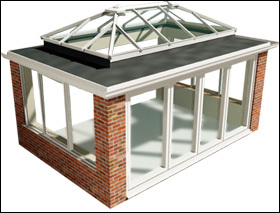 Conservatories themselves abound in many different shapes & sizes some of which can be easily recognised. 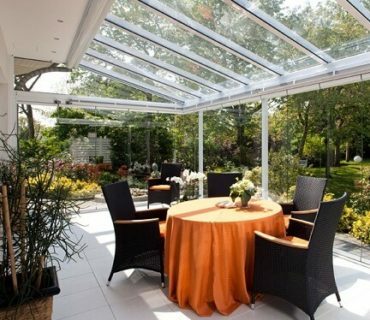 Orangeries are bespoke living rooms with a unique roofing style using lantern or atrium style glass sections. Garden Rooms & Sunrooms (or garden offices) tend to be smaller self-contained and stand-alone. Whichever design or style you prefer, even if it’s just a small lean-to conservatory there is no doubt that adding extra living space will improve the desirability and value of your home. In terms of the materials used to build your conservatory, the most popular choices are Hardwood or uPVC. Generally require very little in terms of maintenance and have a wide range of colours available. They are also energy efficient and can be very cost effective to install, with very many installation companies across England & Wales. Many homeowners take advantage of the lower cost in order to build a “starter room” such as a lean to conservatory. In terms of security, the windows & doors of uPVC conservatories are easily fitted with multipoint locks and most, if not all, of the frames will be steel reinforced. They will last a long time if they are looked after and look fantastic when matched to the property. Many hardwood designs use Oak, which can be expensive, but a lot of installers are moving towards Idigbo, which is a hardwood from Africa and this can be a little less expensive. Alternatively, there are conservatories that can be made from ‘composite’ or ‘engineered wood’. This is re-constituted, man-made, bonded wood used heavily in flooring & panels. Laminated Strand Lumber or LSL is perfectly acceptable to use in structure like a conservatory and may offer a lot of financial benefits to the homeowner who really wants a wood conservatory. It is going to be prudent to give your project some thought before you rush out and order your new conservatory – “an ounce of prevention is worth more than a ton of cure”. So to give you some things to think about, here is a small checklist. How much room do you have to build upon? If you have loads of space then this may not be critical for you, but if not, then how much of your garden are you prepared to use for the new room? You can get a good idea by going to where you want to build the room and marking out the outline with chalk dust or string-lines & pegs. This will clearly show what ground is used and what remains clear. What are you building on top of? Take some time to find out what is going to be underneath your new room. If there are drains, water pipes, manholes etc, you need to consider how to access these once the room is built over them. Foul water manholes would need to be moved. What type of base would be best? Foundations are very important. You have 3 basic choices. Steel bases – these are raise prefabricated bases that sit on plinths. Handy if you have issues like mentioned in point 2) above. Traditional foundations – a series of shallow trenches part filled with concrete on top of which the walls are fitted. How do you want your room to look, will it suit your home or clash? (Lean-to conservatories are very versatile and can fit almost anywhere. They also work well with bungalows as lean-to have a low roofline profile). How are the builders going to get in and out? How are they going to bring in materials & dispose of rubbish? How & where will the builders make their tea? Is it worth the money to build a conservatory? A major UK Building Society estimated that a well designed, well built, good quality conservatory can add up to 10% the the resale value of a house. If you keep around this budget then, apart from the improvement in lifestyle and space, you can be confident that a new conservatory is value for money. Do I have to have a clear glazed roof? Not necessarily. You can have a solid roof (tiled) or part solid / part clear using composite infill panels. Check with your installer about planning permission requirements beforehand. The time it takes to install a new conservatory can be answered in 2 ways. from builder arrival to builder leaving – allow 5 days to 2 weeks depending on the amount of work to be done. 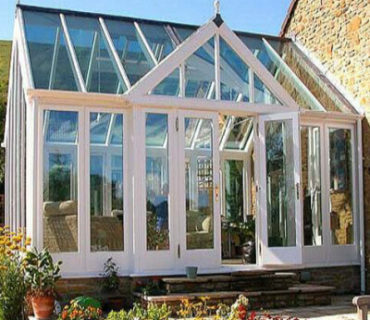 A well built conservatory or orangery can last easily 25 years if you take a little care with it. Double glazed units need to be looked after too – keep them clean and check the seals every year or so. However, some cheaply made white UPVC frames have been know to discolour after a few years. Can I change my old roof for a new one? Yes. 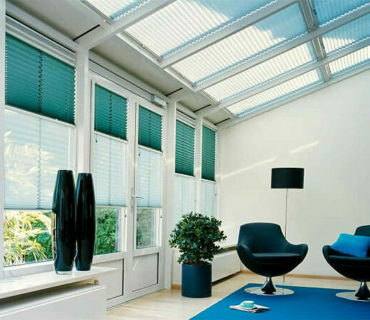 Replacing a conservatory roof is quite common in the UK. A point to think about is if the existing frames can take the added weight, if you are changing from a lightweight glazed roof to a heavy tiled one.